economics, psychology, policy: An Overview of the SIRE Workshop: "Consumer preferences, perceptions and decision-making." An Overview of the SIRE Workshop: "Consumer preferences, perceptions and decision-making." In late October, we held a workshop on “Consumer Preferences, Perceptions and Decision-making” at the University of Stirling. The workshop was funded by the Scottish Institute for Research in Economics (SIRE) and organised by Seda Erdem. The aim of the workshop was to bring together various experts from academia and policy to discuss consumers’ food choices, food safety behaviours, risk perceptions and decision-making. We shared experiences from different country settings, lessons learnt, and drew attention to concerns from Scottish policy-makers’ perspective. Decision-making: What decision strategies do consumers use? 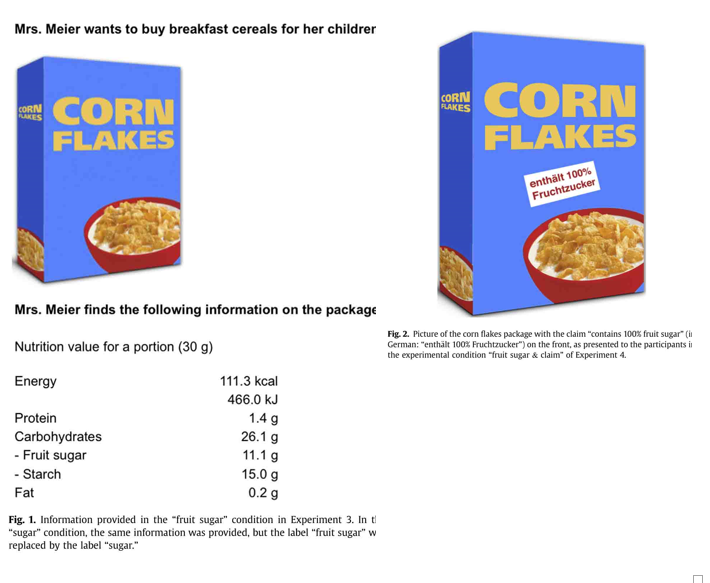 Does symbolic information cause biased decisions? How can we improve decision-making in the food domain? Public Policy: How should public policy consider consumer preferences? What are the current food and diet issues in Scotland? How can we improve Scottish diet? The introduction to the day, given by the organiser Seda Erdem, highlighted the need and motivations for studying perceptions, preferences and decision-making and provided example case studies that help inform decision-making, set priorities in different food domains, and support better communication between stakeholders. While some examples focused on the acceptability of novel foods and technologies, others examined perceived perceptions of responsibility for food safety and trust in information sources. Seda’s talk, available here, also touched upon the importance of understanding the way we make choices: do we consider all food options at supermarkets; what are the eye-catching product positions; and, how can we use such information for nudging towards healthy food choices? The workshop continued with the following three themes. Our first speaker, Liisa Lähteenmäki from the Department of Management at Aarhus University, spoke on “Health, taste, and novelty in food choices”. Her presentation highlighted a number of issues: (1) health and taste have different dynamics in food choices: health perception is based on information, whereas perceived taste requires no information: however, the pleasantness has an impact on perceived benefit; (2) consumers have expectations about taste, and experiences tend to confirm expectations unless the difference between expectation and experience is wide, and (3) the need for better understanding on how food choices and use of food products develop over time. The next speaker in this theme was Leigh Sparks from Institute for Retail Studies, University of Stirling. Leigh’s talk was about the “Place of retailing in food choices”. Leigh’s presentation focused on: (1) the complexity of food choices when there are many different types of retailers in the market offering a large number of products; (2) changes in retail market due to their concentration, scale, and market share in the sector; (3) structural differences between retailers, such as mono-format vs multi-format; (4) development of “new” shopping environments, such as internet shopping, discounters, and convenience shops, and (5) relationship between these factors and our lifestyles. Does the inclusion of "Fruit Sugar" on labels affect perceived healthiness? Before lunch, we had Michael Siegrist from Institute for Environmental Decisions and Consumer Behaviour at ETH Zurich talking about “Symbolic information causes biased decisions”. The case studies Michael mentioned illustrated some of the limitations associated with decision processes, such as how symbolic information affect perceived healthiness and naturalness of product and influence the likelihood of choices, the impact of moral information on food choices, and ways of improving decision-making in the food domain. Another interesting finding from Michael’s research was that consumers might not rely on the most important aspects when assessing a food technology or product. This signals the need for better communication of information about (novel) food products and techniques via, for example, information campaigns and changing the food environment. While information about foods and technologies aims to improve the communication, they may increase the complexity of food choices. In our last presentation of this theme, Jutta Roosen from the University of Munich investigated the complexity of choice tasks and its consequences on food choices. In particular, non-attendance to information about the product was analysed in a hypothetical setting with the help of an eye-tracker, which measures the number of fixation in areas of interest. The findings showed differences in the level of consideration when the complexity of the choice task varied. Our final session of the day was on the public policy and how policy should take consumer preferences into consideration – an important area to ensure better-informed choices and healthier societies. The theme started with presentations from policy-makers at the Food Standards Scotland (FSS) and Food Standards Agency (FSA). Jacqui McElhiney, Head of Food Protection Science and Surveillance Branch of FSS, kicked off the session by introducing the newly established Food Standards Scotland by Food (Scotland) Act 2015 and food safety issues in Scotland and the ways of tackling these issues. Focusing on Scotland, the Consumer Forum 2013/14 showed that habits were influenced by personal circumstances (e.g., living alone, childcare). However, the findings signalled that there was resistance to change, especially when the habits were based on previous experience (e.g., “never had issues before never will have”). Helen Atkinson, a Senior Research Officer from Food Standards Agency, extended the conversation to “The UK evidence base consumer attitudes and behaviour”. 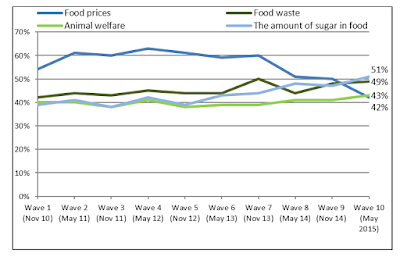 Helen set out the trend in consumers’ attitudes and concerns over various food issues by summarising evidence from two social surveys: Public Attitudes Tracker, a survey conducted since 2001 and The Food and You Survey, carried out since 2010. One of the interesting and common findings of these investigations was that consumers showed a different level of concern over various food issues (as seen in Fig 1), awareness of hygiene standards in eating establishments (see Fig 2) and awareness of the FSA and trust in it (see Fig 3). In particular, the results showed that women were consistently more likely to report a concern about food safety issues compared to men, and 16-25-year-olds were consistently less likely to report a concern about most issues. 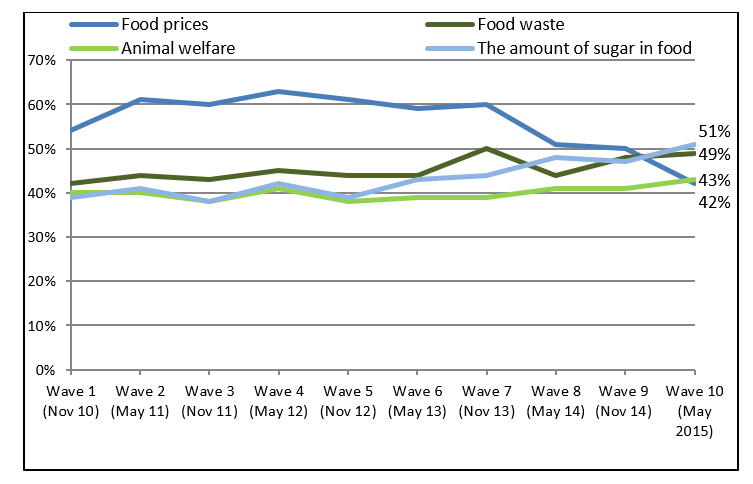 While, staggeringly, 51% of the sample (over 2000 people in the UK) found the amount of sugar in the food concerning in recent years, 49% found food waste, 43% animal welfare, and 43% found food prices concerning. Knowing perceptions over various food issues not only helps us understand target populations for designing better communication interventions, but also provides an opportunity for decision-makers, policy makers, retailers and other stakeholders to revisit issues seemed to be concerning for these target groups. The survey also teased out the way consumers perceive the hygiene standard of places that they eat out at or buy food from. Surprisingly, the general appearance of premises found to be the most important factor to judge the hygiene standard of out-of-home food premises, followed by the appearance of staff, hygiene certificate, and hygiene stickers. 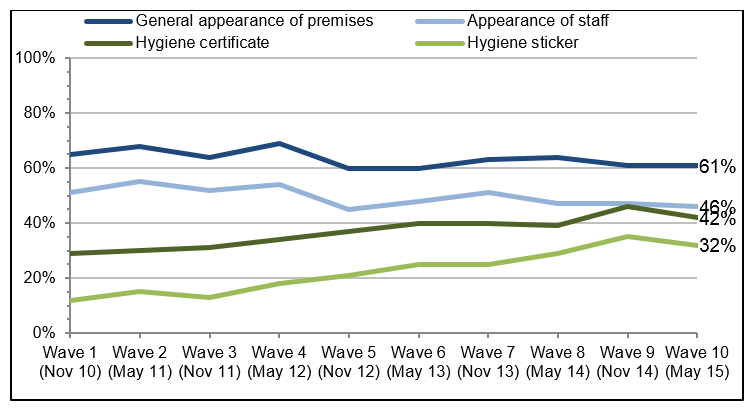 This may also suggest the need for a better way of communicating the hygiene certificates and stickers to consumers, especially when eating out is quite common among consumers (see Fig. 3). Our policy discussion was then focused on the Scottish diet, presented by Heather Pearce, the Head of FSS Nutrition Science and Policy and Gillian Purdon, Diet and Nutrition Advisor at FSS. The big question was what needs to change to improve Scottish diet. According to the FSS Dietary Surveillance Programme reviews, worryingly, little or no progress has been done towards the dietary goals in Scotland. This has been found particularly more problematic in deprived areas. There was also a misbelief about one’s own diet that contributed towards poor diet. 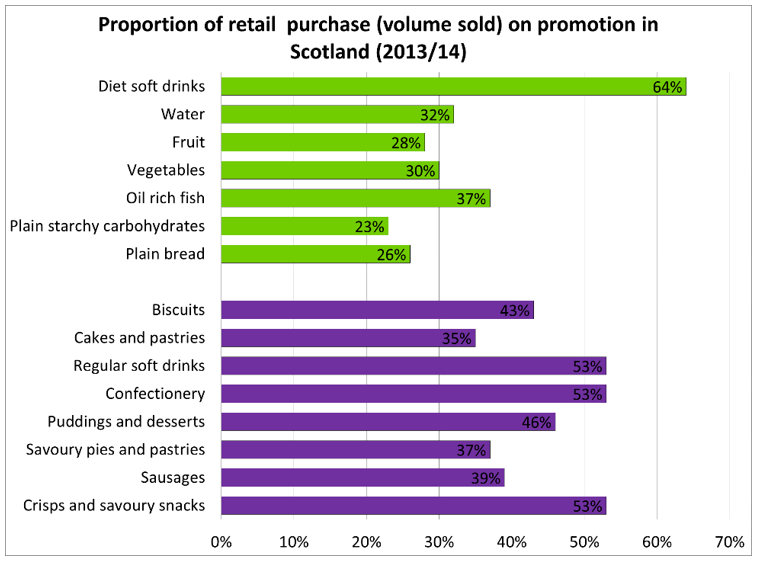 According to the 2014 FSA Food and You Survey, 80% of Scottish people thought that their diet was fairly or very healthy. 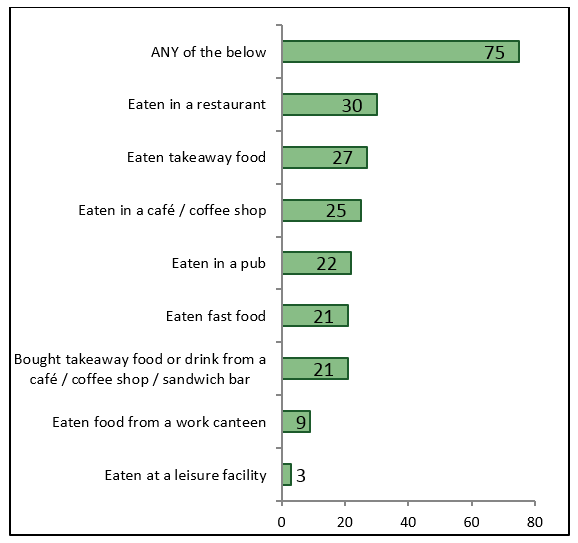 Other issues raised during the talk related to the excessive consumption of discretionary foods and drinks and the availability of promotions on these foods and drinks (see Fig.4) – notably, discretionary foods and drinks were associated with more promotion than other food types. So, how can we promote behaviour change towards healthier diet? Should we limit access to high-calorie foods? 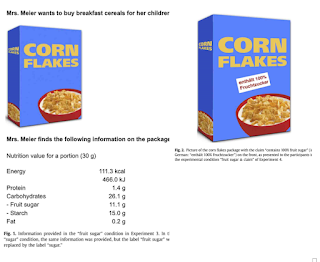 Should we reduce portion sizes, should we change the balance of promotional activity at retail level – if so, how? These were some questions highlighted during the talk and reserved for the panel discussion. The last talk was delivered by Julie Caswell of the University of Massachusetts on “How the public policy should take consumer preferences into consideration”. Julie took the cases of novel foods regulation and analysis of risk as examples. One of the interesting observations was the diversity of the approaches to risks, partly due to the complex and multidimensional nature of risks, which results in unintended confusions in the interpretation of regulations. For example, risk-based systems for food safety consider a set of risks at the same time, allows for all factors in decision-making (including public health), are more transparent. However, they are hard enough to establish consistent regulations based on public health risks and depend on data and analysis requirements. There are significant challenges to the food system for consumers, retailers, policy-makers, academics, and all other stakeholders. One of the valuable lessons learnt from the workshop was that interdisciplinary approach involving various interested parties in the search for answers to food and diet issues contributes to the better communication strategies, as it was aimed in this overview.